Language and Mathematics are a creation of the human mind. Each culture creates their own types of math and language based upon mutual agreement. From the beginning, man has calculated, planned, and predicted. Mathematics grew with civilization and over time mathematics has become more of a universal language. Because of this, the mind can be seen as the greatest tool in the universe. The mathematical mind is responsible for many aspects of our thinking process, patterns/geometry, categorization/hierarchies, classification, predictability, order and mental structure with clearer concepts. We depend on evaluations and calculations to function in life and make things easier for our day to day. The mathematical mind as defined by Maria Montessori from her studies of Blaise Pascal is the part of the human mind which is exact, orderly, precise, logical, and is able to measure, to qualify, and classify the world. This mind is preset at birth, yet it is at that point only a potentiality. If the mind is developed under proper conditions, the mind will grow to great heights. 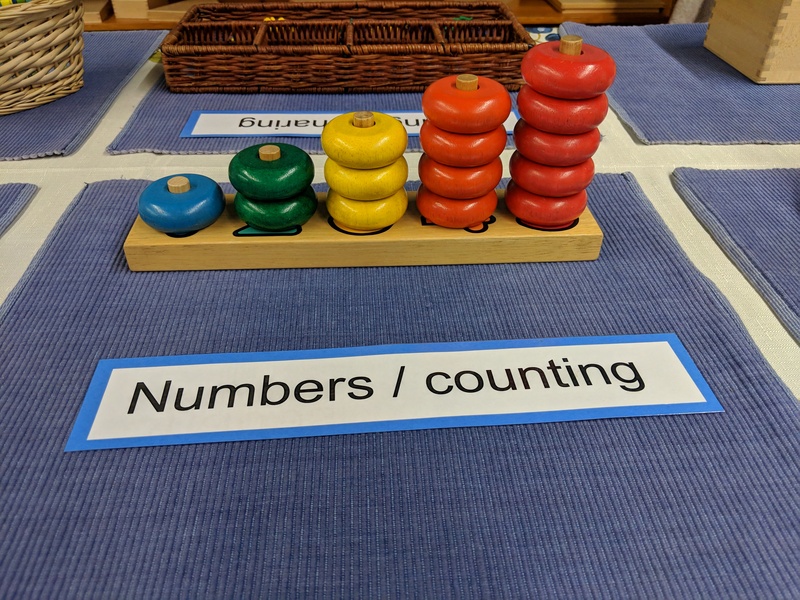 In the Montessori environment, the first materials of Practical life and Sensorial begin to support the mathematical mind with sequential order and precise measurements. This guides the children to discover their world using order and formula. 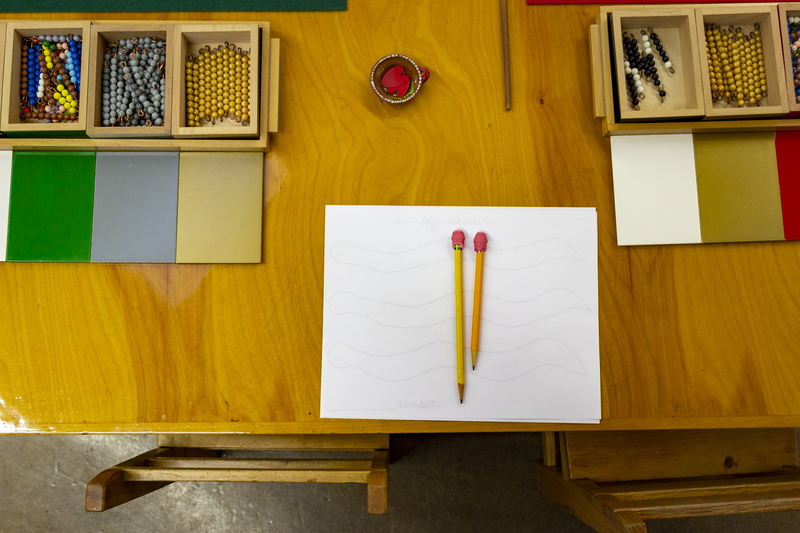 What does mathematics look like in the Montessori prepared environment? Abstract concepts are built upon concrete experiences. The first three years the child's life is full of concrete experiences which indirectly prepare him for the formation of the mathematical mind. He will encounter designed experiences through the prepared environment that help him classify and qualify his surroundings. Every material has an indirect preparation for mathematical concepts. The Sensorial materials are a preparation for the mathematical mind. Arithmetic is introduced in the pink tower, brown stair, cylinder blocks, and all of the graded materials we see in this area. Algebra is introduced with the binomial cube, trinomial cube, and the decanomial square. Geometry can be found in the constructive triangles, geometry cabinet, and the graded geometric figures. Each material builds off of the other solidifying the foundation for his future work. This organized environment will give him order and allow him to develop his organized mind. The child will slowly form his mathematical mind, which comes with a certain level of maturity. 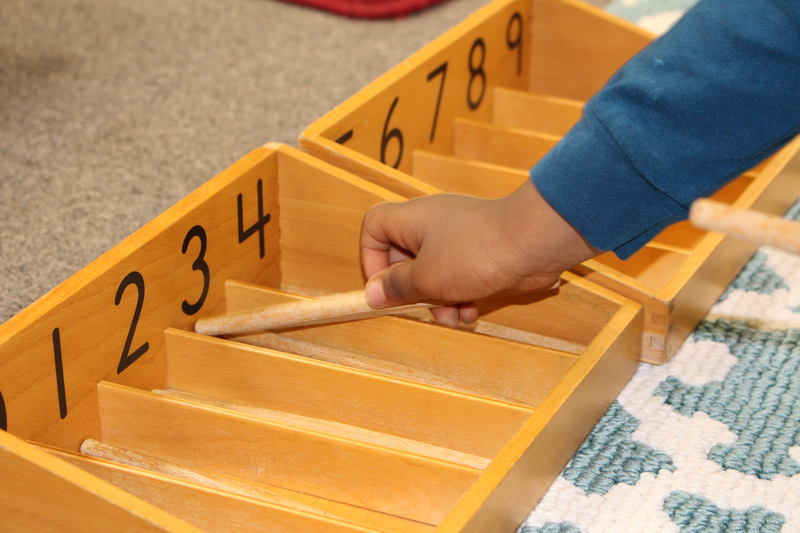 Dr. Montessori made mathematics very concrete for children and offers what she called “materialized abstraction”, which when exploring these specifically designed materials leads to order, clarity, and a foundation for abstraction. 1. Numbers 1-10: The purpose of this area is to give the child concrete experience with the numerals and quantities of zero through ten. The concept of odd and even is also explored in this area. 2. The decimal system: The child manipulates specifically designed materials consisting of units, tens, hundreds, and thousands in order to learn place value and carry out operations. 3. Counting/teens and tens: Introduction on how to build and read the teen and ten numbers and linear counting with the chains. 4. Exploration and memorization of tables: Children use materials to aid in the memorization of the addition, multiplication, subtraction, and division facts. 5. Passage to abstraction: This area, although still concrete, is more abstract in that the pieces are the same size with more subtle differences than those of the Golden Bead materials. 6. Fractions: Introducing at a very basic level fraction as a quantity and simple adding, subtracting, multiplying, and dividing.